Although State Implementation Plans (SIPs) typically rely on observations from ground-level monitoring networks and regulatory modeling, satellite data is increasingly available to state agencies. Below is an example of how one state agency used satellite data to supplement a state implementation plan to improve air quality. An advantage of satellite data is that it provides information for a broader area than sampled by ground-based networks. 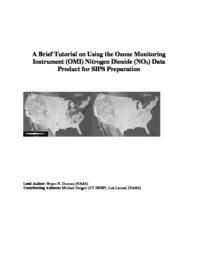 This document provides examples and guidance for using satellite products of nitrogen dioxide (NO2), a precursor to ground-level ozone and nitrate aerosol, in state implementation plans. It also provides some guidance on using SO2, a precursor to sulfate aerosol. This technical guidance document was produced by the NASA HAQAST Tiger Team "Supporting the Use of Satellite Data in State Implementation Plans (SIPs)" led by Professor Arlene Fiore. For additional resources see: https://airquality.gsfc.nasa.gov/aq-managers. Professor Fiore's website: http://blog.ldeo.columbia.edu/atmoschem/.